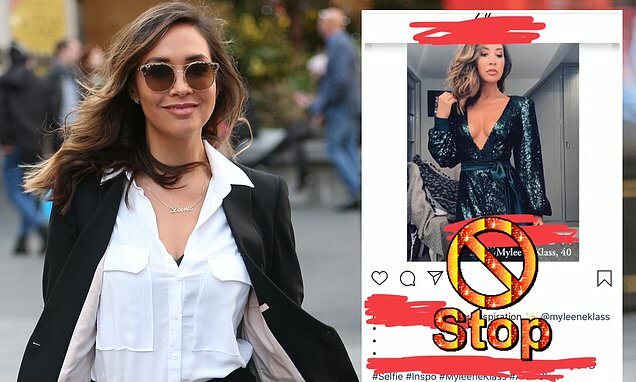 Myleene Klass has hit out at a plastic surgery site that was using her image in adverts without her permission. The 40-year-old radio host took to Instagram on Tuesday to reveal she'd stumbled across her picture being used to promote cosmetic enhancements and shared the comment she had left demanding it be removed. Insisting she has never been under the knife herself, she quipped she earned her figure through 'hard work, hustle and gaffer tape' and encouraged women to love their bodies as they are. The screenshot of her comment read: 'Please take this down. If a woman wants to change her body, that's her choice but to use ny image which hasn't been near a knife to sell your promises of perfection is not inspirational but false advertising plus, you don't have my permission [sic]. 'I don't want women to see this and feel pressured to manipulate their bodies when they are perfect as they are.